This DLL plugin unlocks the skill level caps of 100 and makes some relevant leveling tweaks.You can treat it as Skyrim-Community-Uncapper SSE version. Features:Redefine skill level caps;Redefine skill formula caps;Redefine skill exp gain mults;Redefine PC level exp gain mults...etc. 1.Elys for Skyrim-Community-Uncapper, though I have to reverse the game engine again,she indicates the direction that saves me a lot of time. 2.SKSE team for their great work on SKSE&F4SE, without them, whithout this plugin. 3.brofield for his great work on SimpleINI,a cross-platform library that provides a simple API to read and write INI-style configuration files. 4.herumi for xbyak that enables dynamically to assemble x86(IA32), x64(AMD64, x86-64) mnemonic. - Added support for the launch of Creation Cancer.Now this plugin is designed to be version indepedent,it uses signature scan to find memory address at runtime,so as long as the function sig doesn't get broken, this plugin should work fine with monthly CC update. - Fixed an issue where skill effect like armor rating,spell damage and weapon damage doesn't scale with uncapped skill level. Add more options for SkillExpGainMults and LevelSkillExpMults based on PC level. Add more options for SkillExpGainMults and LevelSkillExpMults. Add safety check for enchanting weapon when your enchanting skill is too high to avoid issues. More detailed explanations for INI settings. Add version info for DLL . Correct some spelling errors in INI file. hotfix for generating new ini file. Fix a bug that PCLevelExpMult doesn't work normally. Add some misc options for legenary skills. Add verision check for SkyrimSE.exe. Fix perks gained per level up. Fix level list bug when read INI data. It is a DLL plugin that unlocks the skill level caps of 100 and makes some relevant leveling tweaks.You can treat it as Skyrim-Community-Uncapper SSE version. Highly customizable, you can modify almost everything listed above in INI file. SKSE64.You can still use original dll loader you use,just overwrite the old version SkyrimUncapper.dll with new version dll. 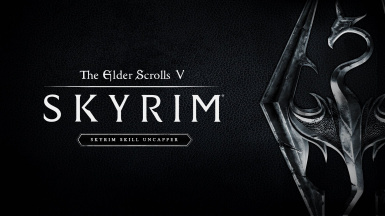 Install this mod via NMM or Copy the plugin folder to Skyrim SE's Data folder. When you first run the game after installing this plugin,an INI file will be created in the same folder as SkyrimUncapper.dll.You can modify it to suit yourself. For MO users,if you run game through MO,the INI file will be created in MO's overwrite folder,you can copy or move it to your uncapper folder. Config INI file and then play!You can refer to DirtyWeaselMedia's Skyrim Skill Uncapper .ini for Ordinator or just use his INI file. Elys for Skyrim-Community-Uncapper, though I have to reverse the game engine again,she indicates the direction that saves me a lot of time. SKSE team for their great work on SKSE&F4SE, without them, whithout this plugin. brofield for his great work on SimpleINI,a cross-platform library that provides a simple API to read and write INI-style configuration files. herumi for xbyak that enables dynamically to assemble x86(IA32), x64(AMD64, x86-64) mnemonic. reg2K fo his signature scan algorithm.